For some people, it is hard to deal with the fact that not everyone is going to like them. 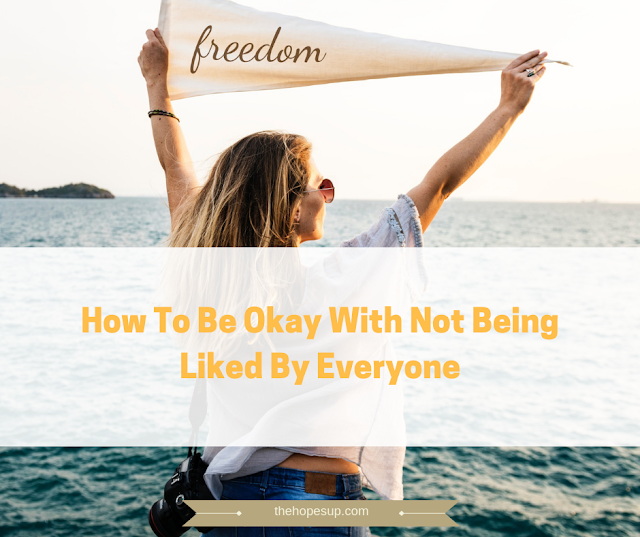 While it is understandable that you would want to maintain a cordial relationship with the people in your life, but stressing about being liked by every person you meet is not healthy. You think even if one person doesn’t like you, it means you must be lacking in something. You take it too personally. -You constantly seek validation from others. -You always want to prove yourself to others. -You also tend to compare yourself to others. -You only feel happy when someone praises you. As a result, you keep trying to please everyone and keep searching for happiness outside of yourself. But what you forget in this process is that different people have different perspectives. Just think about it, when you interact with so many people every day, who come with their own baggage, their own perceptions, how can you make sure that you would be liked by all of them, and that your opinions and interests will completely match theirs? If a particular person doesn't reciprocate your feelings, try not to worry too much about it. Just like you have a certain set of beliefs, views, and interests, similarly, other people have their own way of thinking. You can’t do much to change their views and perceptions. If you focus too much on doing that, you’d be essentially wasting your time. 1. Be clear about your strengths and weaknesses. Being aware of your strengths and celebrating them will make you feel more confident about yourself. It would make it easier for you to deal with unpleasant feelings. Also, being aware of your weaknesses will make it easier for you to accept it when you make a mistake and correct them in a better way. You will also be able to handle criticisms positively. 2. Figure out how you can improve yourself. When are not entirely confident about yourself, you tend to be really worried about what others think of you. However, if you focus on improving yourself and build self-confidence, you will gradually stop waiting for external validation. When you are clear about what you want, and you are determined about achieving your goals, you won't be bothered by what anyone else thinks about you. Instead, you would be focusing on bettering yourself. You won’t be waiting for others to make you feel better about yourself because you know you can do that yourself. 3. Focus on the people who do like you. When you regularly worry about what people think of you, you can never be appreciative of what you have. This way, you could be surrounded by supportive friends and family, and you’d still be obsessing with a particular person who doesn’t like you. You need to admit the fact that there always be someone who won’t like you for some reason or maybe no reason at all. Understandably, it is frustrating to accept this fact, but the sooner you do it, the happier you will be. If you focus on the things and people that make you feel good, you wouldn’t feel left out, and you wouldn’t be so obsessed with making everyone like you. Don’t lose your authenticity in order to impress everyone. You may not be perfect, but no one really is. Wanting to be someone you are not while trying to make everyone like you, is not a good idea at all. Do not let other people determine your worth. Do not let yourself become so vulnerable to other's negative opinion of you. If you always focus on getting the approval of others, you will never be sure of what you actually want. And no matter you do, you will always feel dissatisfied. You will end up being miserable. Believe in yourself, follow through on your goals and don't be afraid to show your true self without worrying about what others will think of you, because it's not in your control anyway. If you someone doesn’t like you, move on. It’s not easy, but you have to learn to do it. And, once you do, you will be free. You will realize how happy you can be when you get rid of this unrealistic expectation of being liked by everyone. Do you struggle with getting rid of the desire of being liked by everyone? How have you dealt with it until now? if you found this post helpful, do not forget to share it. Excellent advice! Lately, it seems like there are a whole lot more people that don’t like me, than do! I’ve been having some conflicts at work, but much of that is just because I am ready for a change (new job, new start). I don’t have a ton of friends, but I do have four or five people that I know love me for me, and appreciate me, and you are right, I need to focus on, and be grateful for those people. Love # 3! Good stuff! It's funny how we always end up focusing on the lack and end up feeling miserable. It's great that you are appreciative of the people in your life. Sometimes little appreciation of the things and people in our lives is all it takes to feel happier. Thank you for the wonderful comment, Rebecca! And good luck with your new job. Thank you! As I get older, I’m seeing that I also need to work on anger issues. I’ve never considered myself to be someone who struggles with anger, but lately, my patience has been tested – especially in traffic situations! I totally get it! I'm usually a very patient person, but lately, I feel like I have become more irritable. Part of adulting I guess. We just have to deal with it rationally!